Don’t be fooled, this isn’t your standard toolbox. The tools used at Hammer & Nails come in the form of steamed towels, straight razors and scissors, nail trimmers, and foot scrub to name a few. And it doesn’t stop there. With men’s grooming being a $21 billion a year market, Hammer & Nails has truly carved out a niche for itself by being first-to-market with this men’s grooming concept. According to Statista, by 2024 men’s grooming is anticipated to grow to a $29.14 billion a year market. Industry PR Wire states that more and more men are becoming conscious about their appearance and grooming which has now become important for a healthy professional and personal life. This includes monies spent and products and services. This is great news for concepts like Hammer & Nails that offer multiple revenue streams to sweeten the deal for its franchise owners. Revenue streams at Hammer & Nails include retail product sales, service delivery, private events, gift cards, and monthly recurring membership dollars. So let’s take a peek inside a Hammer & Nails shop to find out what all the rage is about. Gentlemen, this isn’t your typical barbershop. Hammer & Nails has specially designed its grooming shop to give you that old school barbershop experience but in a classy modern day environment. Not only that but with expanded services that could traditionally only be found in female-centric salons. From the moment you enter the shop every detail is designed to replicate that man cave environment and make you feel comfortable and at home. Each service comes with a complimentary beverage that ranges from non-alcoholic drinks to a nice smooth bourbon on the rocks. To sweeten the deal, you also have control of your own private big screen TV along with a pair of Bose noise-canceling headphones. What better way to escape everyday life but with a cocktail in your hand while enjoying some personal grooming and watching your favorite game on the big screen? Whether you’re looking for a nice straight shave or sports pedicure, Hammer & Nails has got you covered. Men’s Hair and Shave Services include such offerings as a Classic Cut, Tune Up, Beard Trim, Grey Camo or Beard Camo colorings, several Face Shave options, or a straight razor head shave. And don’t forget the hot steamed towel to finish. 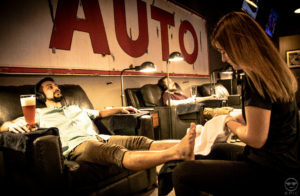 Hand and Foot Care Services include such offerings as a classic manicure or pedicure; sports pedicure designed to increase circulation, relieve stress and muscle relaxation; the Jack Hammer Combo or several other combo options such as the Hops & Cedar Combo and Big Daddy Aromatherapy Combo. 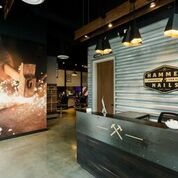 Given the Hammer & Nails concept is focused on providing an “experience” for its clientele base, the shop can be reserved to accommodate private parties. 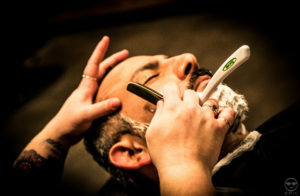 Whether it’s the unique “man cave nirvana” environment, the unique focus on providing hand and foot grooming services alongside barbering and shaving services, or the multiple revenue stream business model, Hammer & Nails has truly carved out a niche for itself in this booming market segment. Minimum requirements include $100k liquid cash and a $500k minimum net worth.